This is part 2 of the Dressage Ladies series on barn drama and intrigue. The names have been changed, and I'm adding my own spin, but the events are "real" and unembellished. Read Dressage ladies, part 1. Of the people I know at Greener Side Farm, Karen is the most fun to hang out with. She has a mischievous sense of humor and she finds everything funny, which is a good quality to have at Greener Side Farm. If someone had told me she was a standup comic I wouldn't have batted an eye -- so I'm shocked to learn she is a computer programmer. Karen's a fellow geek! She designs software that hospitals use for patient records management. 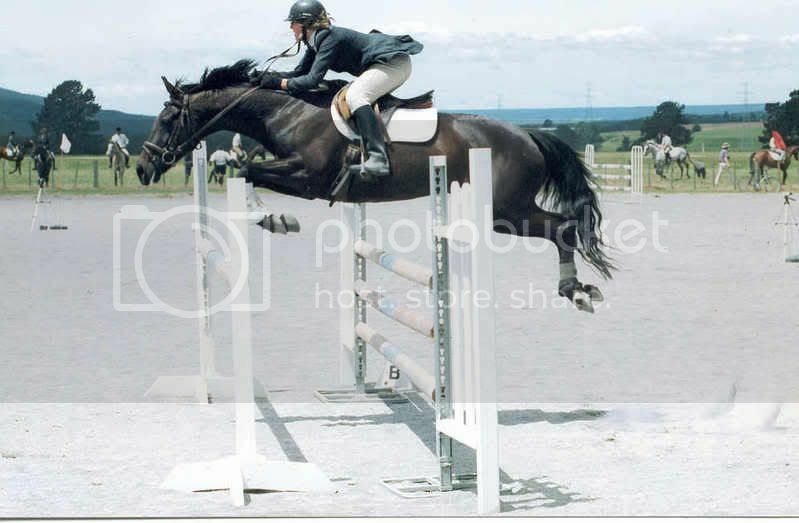 Karen used to ride with the dressage trainer Natalie when Natalie was at a different barn. I suspect they parted ways because Karen was not sufficiently worshipful. Now Karen leases another boarder's horse at Greener Side, and Karen and Natalie avoid one another. The horse Karen is leasing is badly injured in the pasture and out of commission for a few months. 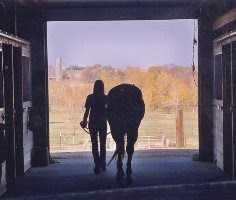 In the midst of a difficult divorce, Karen confides to me that riding is her therapy. Hmmm, I think. Greener Side Farm turnout is a little sporadic, so Harv needs to be ridden daily. I ask if she'd like to ride Harvey a day or two a week. She eagerly agrees, and that same weekend she pops up on him. We work in the indoor, where several of the dressage ladies are riding. Is it my imagination, or are we being observed with more than casual interest? I dismiss the feeling and become absorbed in watching my own horse under saddle with a nice rider. Harv trots along looking relaxed and happy, and Karen praises his attentiveness. We make arrangements for her to ride him a few days a week, and we are both happy with this win-win situation. A week or so passes. Then one day the barn owner approaches me. Speaking in a hushed tone, he tells me that someone has complained that Karen is training Harvey -- and it is against the barn rules to use an outside trainer. I explain that Karen is not training Harvey; it's not even a lease; no money is changing hands. Furthermore, my own trainer Amanda has given the arrangement her blessing. As I make my case, the owner looks pained and uncomfortable. When pressed he admits that Natalie had complained, and I realize that the facts of our arrangement do not matter. He tells me that Karen is not to ride Harvey. In fact, she is not welcome at the barn any more. The barn politics at Greener Side Farms are tiresome, for sure, but this incident weighs heavily on my mind. I feel guilty and angry. Karen calls me several weeks later -- she has found another barn, and another horse to ride. She reassures me that she is doing okay, and she isn't really surprised that Natalie had caused a fuss. I am furious at Natalie, who I can't easily avoid. When we meet, she is agressively cheerful as is her usual demeanor. I try to be nonchalant in her presence, but privately I vent to my trainer Amanda. Amanda listens sympathetically but is careful not to say anything impolitic. Her advice: stay off Natalie's radar. Didn't you think we left this all behind in high school?? I did too. That's why the term "arrested development" was invented. :) I enjoy your blog. The childishness of barn politics never ceases to amaze me. How absurd. REading this makes me feel VERY fortunate to be able tohave horses at HOME. Your grace with dealing with this situation thus far is inspiring. I am afraid I would have had to invite myself to leave, after exchanging a few choice words with the other trainer... Looking forward to the next installment! Unless you are extremely pleased with the barn you are at, I say move your horse. Life is too short to be pushed around by people who don't know the whole story and have nothing better to do. I am also a boarder and I speak my mind but it's only when the safety of the horses is concerned. I think your barn owner was wrong, and if safety for Karen was an issue, all they had to do was have her sign a waiver. Always follow your gut instinct and if that situation felt wrong, it's because it was wrong. Good luck and I really enjoy your blog! Boy, I know I would not be happy to be told who could or could not ride my horse. And I would be a little peeved that my own trainer didn't go to bat for me, either. It's shameful to hear of adults acting this way. Personally I agree with dawn and would move my horse. In fact, I did just that years ago when the clueless barn manager's antics with me got out of hand. My trainer and I were both sad but she supported my decision and trained me elsewhere. We ended up boarding together at other barns after that and are still working together. There was so much going on at that barn. Imagine a grand prix dressage rider sharing a facility with a cutting and reining trainer. The latter was what actually drove me away, but I hung in there for years, because I worked there on Sundays for free board. Stay tuned!